GRACIE SMITH hadn’t had a cigarette since 1999, so when her bad cough started she figured it was hay fever. When it lingered, doctors guessed bronchitis or pneumonia. Months later, the devastating news: lung cancer, with a suspicious lesion on her brain. That was in 2015. Today, the 65-year-old Elk Grove resident is feeling great, and her tumors are under control, thanks to a novel trial developed at UC Davis Comprehensive Cancer Center that combines radiation treatment with immunotherapy. 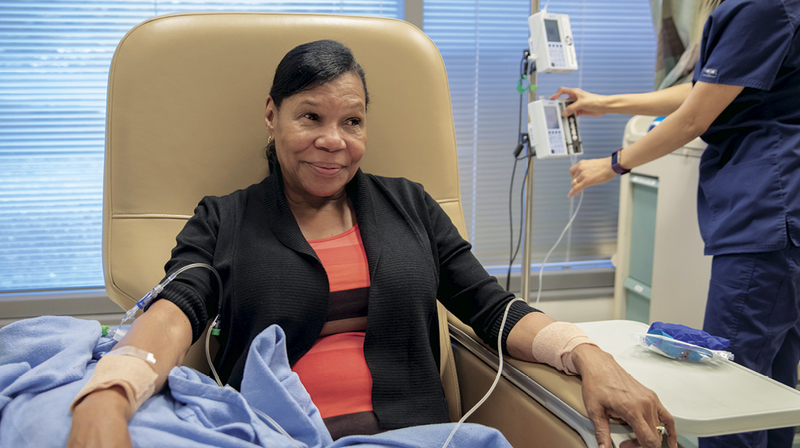 Today, the 65-year-old Elk Grove resident is feeling great, and her tumors are under control, thanks to a novel trial developed at UC Davis Comprehensive Cancer Center that combines radiation treatment with immunotherapy. Smith is benefiting from a quiet revolution going on in cancer care. 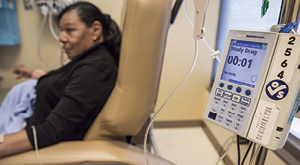 New immunotherapy drugs called checkpoint inhibitors are helping many people with cancer who might otherwise have no chance. Unfortunately, these therapies, also called PD-1 or PD-L1 inhibitors, only work for about 20 to 25 percent of patients. UC Davis physician-scientists are working to understand how immunotherapies work and how to make them work so they can help more people. 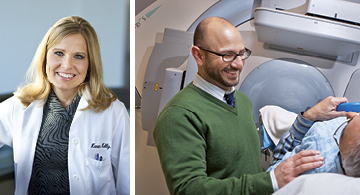 Medical oncologist Karen Kelly and radiation oncologist Arta Monjazeb are collaborating on a series of clinical trials for patients with non-small cell lung cancer to do just that. One of cancer’s many tricks is fooling the immune system into thinking the tumor is actually healthy tissue so the immune system leaves the cancer alone. By inhibiting PD-1 or PD-L1 proteins, checkpoint inhibitors help the body’s disease-fighting T-cells recognize tumors and attack them. Smith, now retired, says she is grateful for the clinical trial that has enabled her to enjoy life and plan the next phase: a move with her husband to North Carolina. But these therapies are frustrating — either they work like gangbusters or not at all. In rare cases they can even make cancer worse. By killing cancer cells, radiation releases neoantigens, molecules the immune system learns to recognize, leading to an increase in T-cells. The hope is that by increasing the number of cytotoxic T-cells through radiation, and taking their brakes off with PD-L1 inhibitors, the immune system will be better able to hunt down and kill cancer cells. “The overall idea is to use combinatorial strategies to improve on the already promising results of checkpoint inhibitors and extend that benefit to a wider population,” says Monjazeb. The only way to improve care is to test new ideas. Kelly and Monjazeb are conducting clinical trials to optimize this combination approach for patients. The first one is using a PD-L1 inhibitor and radiation in patients with stage IV, metastatic lung cancer. These trials are in their earliest stages, but preliminary findings have been encouraging. The team hopes they can replicate the results for Smith, who had stage IV lung cancer but could not tolerate chemotherapy. The timing issue is critical, as it could dictate whether the combination works at all. The team is testing a number of therapeutic variations to find the right approach. A second trial is studying immunotherapies and radiation for patients with early-stage lung cancer, who might normally receive only radiation or surgery and radiation. Unfortunately, the cancer often comes back in another part of the body. “The idea is that the combination will be better than either therapy alone,” says Monjazeb. Two other studies are geared to help patients who don’t respond to checkpoint inhibitors at all. One combines the PD-L1 therapy with a vaccine. Hopefully, the vaccine will shine a light on lung tumors so the unchecked T-cells will know where to go. The other combines radiation with interleukin 2 (IL-2) injected directly into tumors. Like the vaccine, IL-2 may increase T-cell activity. At the time, Smith was still working in the Sacramento County accounting department, and the effects of chemotherapy became too much to bear. The team will continue with their clinical trials, but there’s another important layer: collecting tumor, blood and other samples from patients for further study. By investigating genes, proteins and other molecules, they hope to better understand why some patients respond to treatment and others do not.